Saskatoons and Juneberries - What They Are, Where to Get Them and How to Use Them! Looking for Saskatoons in 2019? Scroll down this page and follow the links. And if you bring home some fruit or vegetables and want to can, freeze, make jam, salsa or pickles, see this page for simple, reliable, illustrated canning, freezing or preserving directions. There are plenty of other related resources, click on the resources dropdown above. 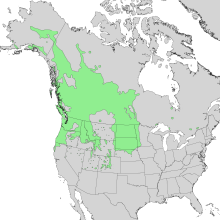 If you live in Canada or the far northern areas of the U.S (mostly in the Northeast U.S., Great Lakes region and the northwest)., you may have heard of Saskatoons, which are also called Juneberries or Serviceberries. Juneberries grow wild across the northern U.S. and Canada.We'll use the terms interchangably. The saskatoon cultivar (variety) is now being grown commercially in Michigan and Canada.The commercial variety is a product of 30 years of breeding in Canada. Sakatoons and Juneberries look much like a blueberry but are dark purple.with an apple taste. Which makes sense because the saskatoon is a distant relative of the apple. Others say they taste like sweet black cherries or a mild blackberry. They have soft, tiny (and completely edible) seeds, which some say, give them an almond like taste, too. Select plump, full saskatoons with a dark-blue purple color. A berry with any hint of light red isn't fully ripened. White and green colored saskatoons will not ripen after they are picked; while saskatoons that have already turned purple, red or blue-ish usually DO ripen after they are picked (if they are kept at room temperature to ripen). Since saskatoons hang on the bushes in bunches a but like grapes do, the easiest and fastest way to pick them is hold your bucket under them in one hand and with your other hand, cup a ripe bunch and gently rub them with your fingers. The ripe berries will drop into your bucket, while the unripe ones will remain attached to the bush. I can easily pick 2 gallons per hour (if I'm not being distracted by the kids and the sun isn't too hot!). A newbie might do 1 gallon per hour. Chill berries soon after picking to increase shelf life. Store your fresh saskatoons in the refrigerator as soon as you get them home, without washing them, in a covered bowl or storage container. If refrigerated, fresh-picked saskatoons will keep 10 to 14 days. Freeze berries in freezer containers without washing to keep the skins from toughening. Place berries one layer deep. Freeze, then pour the frozen berries into freezer containers. Because unwashed saskatoons freeze individually, they can be easily poured from containers in desired amounts. Remember both frozen and fresh berries should be rinsed and drained just before serving. Just before using, wash the berries in cold water. Saskatoons/ Juneberries / serviceberries are 18 % sugar, and about 80% water, which is a lower moisture content than blueberries. They are nutrient-dense, with high levels of protein, calcium, iron, and antioxidants. Juneberries are an excellent source of iron (almost twice as much iron as blueberries), relatively large amounts of potassium (twice as much as blueberries); large amounts of magnesium and phosphorous and high levels of phenolic compounds, anthocyanins. from Mazza, G. (2005). "Compositional and Functional Properties of Saskatoon Berry and Blueberry"
Saskatoon berries contain significant amounts of total dietary fiber, vitamins B2 (riboflavin) and biotin, and the essential minerals, iron and manganese, a nutrient profile similar to the content of blueberries. For more information, see this page on Cornell University's website.